Yesterday, the Rays played a day game on a cloudless day in Denver. 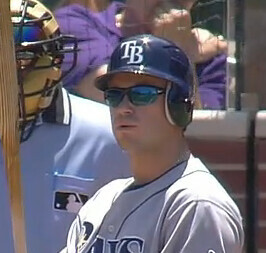 In the first inning, Evan Longoria stepped to the plate wearing Nike sunglasses. He struck out swinging on a 97mph fastball up in the zone. In his next at bat in the 3rd inning, Dirtbag was sans shades. This time he struck out on a curve ball in the dirt. He also swung and missed at 97mph fastball up in the zone for strike two. 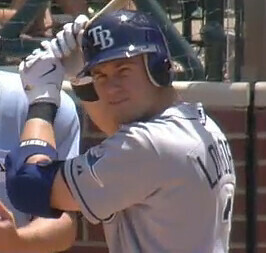 Longo did single in the 5th and was hit by a pitch in the 7th, both times without the sunglasses. And then in the 9th, he once again struck out without the sunglasses, on a slider in the dirt. The first thing we noticed was how much Longoria squints when he is not wearing the shades. Longoria does quint a lot, even at night, but this was more than normal. And we have to imagine that it cannot help that Longo wore the shades in the field, so the only time he had the shades off was when he was batting. So we wondered if Longoria struggles in day games. The day/night splits say “maybe.” Longoria has an .872 OPS in day games, and 1.040 in night games this season. A big difference, but .872 is not terrible. Last year he was .736 in day games and .929 in night games. So then we got to wondering how often he wears sunglasses while batting. Interestingly we had to go all the way back to April 26 in Oakland to find another day game with sunny conditions. 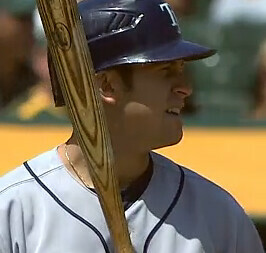 Here is Longo in that game. Again, no sunglasses and lots o’ squints. In total, the Rays have played 4 games in sunny conditions this season, and Longoria is 5-15 with 5 strikeouts, 2 walks and a hit by pitch. That includes a 3-5 outing in Baltimore the second week of the season. And while we have not gone through every at bat, it appears as though yesterday’s first at bat was the only time this season he wore sunglasses while batting. Does Longoria struggle in the sun? The numbers suggest that he does, and he certainly looked uncomfortable yesterday. And his indecisiveness when it comes to sunglasses suggests that he is struggling to find a comfort zone in day games. as a former player, I could NEVER step to the plate wearing sunglasses, no matter how bad the sun was. just something about having a layer between your eyes and the ball...very unsettling. wouldn't doubt if that was the same with him (as it is with many players). wearing them on the field is one thing...but having them on with a helmet pressing against them and, like i already said, having glasses distort your view as the ball is coming at you puts you out of your element. sure, it's a mental thing...but i'm not gonna say he needs to change a dang thing about his mental approach. I will second that...I always hated the sunglasses when hitting and never understood how other players did it. And as a catcher i could never wear them behind the plate either. I think pitchers are just pitching to him better regardless of the lighting. When he comes up to the plate for pitchers low and away, except when he crushed that inside fastball on Wednesday. I say he was just trying something different and he likely didn't wearing the shades the first AB so he scrapped it all together. It had clouded over by the final at bat. The sad thing is that even the Rockies announcers commented on how much better Zobrist was laying off the slider (which was always a ball from Street) than Longo did in that at bat. His strike three was way off the plate and in the dirt. Not as strange as at the trop last week. Did nobody else notice his third at bat, against the Nat's? NO GLOVES....what? Watches first pitch for a strike..
Wonder if opposing pitches know this?